2011 May «Suad Bejtovic Photography etc. Suad Bejtovic Photography etc. I talked about The Formula before. All you need for a good photo is the golden hour light, just after sunrise or just before sunset, and Velvia 50 slide film. It almost doesn’t matter what your subject is; the colors that the chemical engineers in Fuji laboratories cooked up are so bold, they’re their own subject. The Formula has some limitations and challenges. Slide film traditionally has a rather low dynamic range, meaning that your dark shadows (which usually afflict your photos during golden hour) are going to be indistinguishably black if you’re not careful. Even if you are careful, there’s often not much you can do. Such was the challenge here. 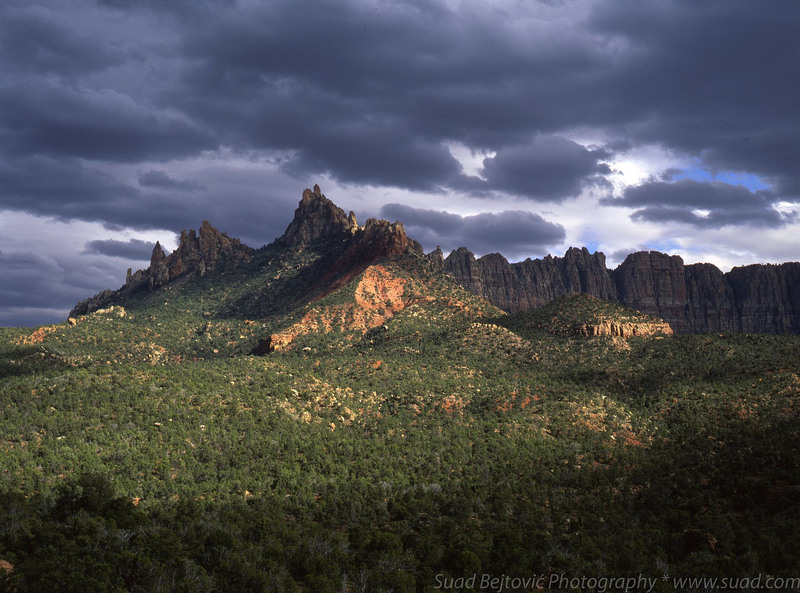 These are the Towers of the Virgin, a series of ragged peaks soaring hundreds of feet above the little alcove at the mouth of the Zion Canyon, right behind the Visitor Center and museum. They have good fortune that they face the east and that their view of the rising sun is largely unobstructed. The bad fortune is that this geographical position makes them an easy favorite for sunrise subjects of photographers of all skill levels. I’ve been to Zion with Tyler and John two different times before, and we have never been around this area this early in the morning. Below, in black and white, is a shot from one of the previous visits, where we snapped a few quick shots of this same scene in the afternoon. We also did some moonlit shooting on another occasion. So, on this morning, we decided to take this cliche shot off our to-do list. I had some trouble composing the photo above. My normal lens was a bit too long, and some of the peaks would be left out of the shot. The wide angle lens seemed like an obvious choice, but I was frustrated that my shot consisted of a large swath of blue on top, equally large swath of black at the bottom, with a little strip down the middle. The solution was simple – cut off the top and the bottom, and embrace the panoramic quality of the subject. There was really no point in trying to bring out the uninteresting vegetation of the meadow in the foreground. The resulting format is a little wider than 2:1, but I think it fits the scene. That afternoon, many photographs later, I will visit a park gift shop and find a similar shot on a very wide souvenir magnet; it’s nice to see that I have the same thought process as the park’s merchandising department. I’ve been traveling with Tyler and John for four years now, for purposes of enhancing our friendship as well as our photography skills. And if there’s one thing that we bonded over more than over lens caps and ISO settings, it’s botched sunset shoots. If there’s one thing we can count on, that’s a less-than-perfect sunset. And here we were, three hours before sunset, after a morning hike to Angels Landing, after driving up a bad dirt road, getting perilously off the hiking trail, setting up our tripods in between the bushes and trees, wondering if we will get rained on before the skies clear and allow some sunlight onto the peaks in front of us. 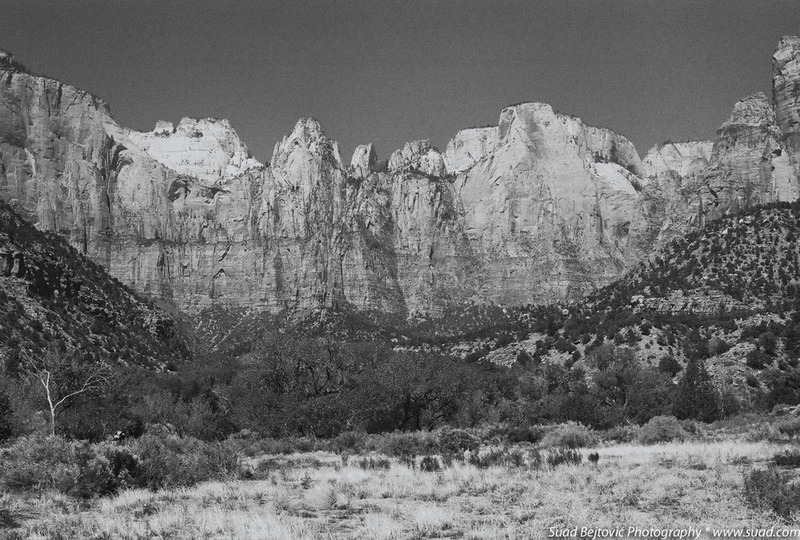 The peaks are called Eagle Crags, and they’re located just outside Zion National Park, near Rockville, UT. We saw them a few sunsets earlier, as they were the peaks getting the very last light, due to the fact that they’re outside the main canyon of the park, so the light lingers on them just a little longer. Tyler found a road on the map, and the road led us to a BLM hiking trail, which eventually goes all the way to the foot of the Eagle Crags hill. Skies were dark and foreboding, which made for a dramatic background. 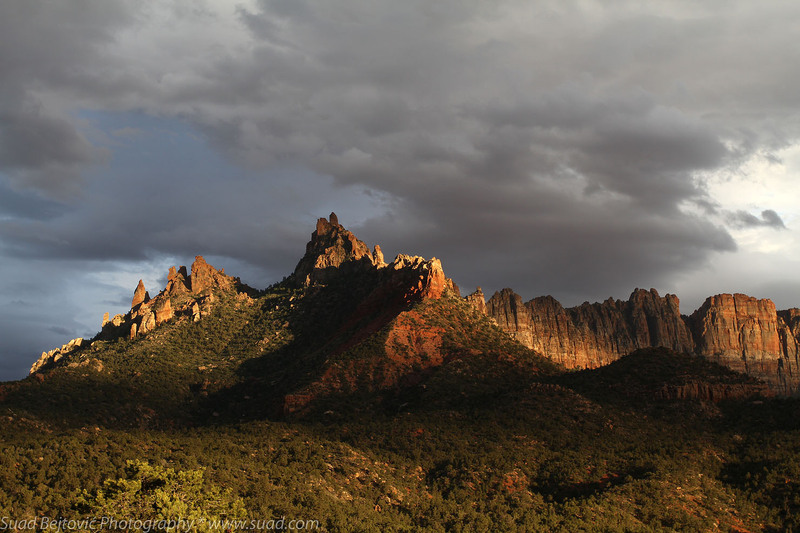 We were cheering for the sun to break through the cloud bank to the west and light up the red sandstone. We had reason to hope: it happened a little earlier, but it was not the magical “golden hour light”. I captured it on Fuji Velvia 50 film, shown here, and it looks nice, but it’s not quite the same as the main digital photo, taken just that much later. Light was changing fast, and I never snapped another film shot. I didn’t even time to change my lens – it was gone in a flash. Still, we’ve seen some photos in the local galleries, and this formation, somewhat off the beaten path, offers great potential for some wonderful sunsets. On this evening, however, our tradition continued. This was the fourth consecutive year that I took a photography-focused trip with my friends Tyler and John. Even though we’ve been there before, we decided to come back to Zion National Park and explore it a little bit more. More on that later. 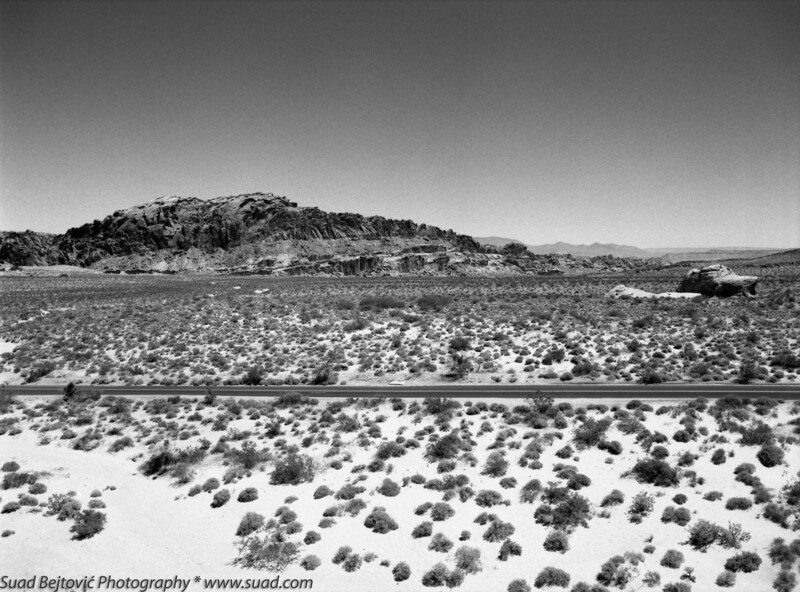 As on the previous trips to Southern Utah, we flew into Las Vegas, rented an SUV and drove north. This time around, we decided to stop at the Valley of Fire State Park, which is only a few miles off the main interstate. The park is the home for many interesting rock formations, and several examples of petroglyphs, drawings carved in stone by ancient peoples inhabiting this area. This shot was taken from an elevated platform by the Atlatl Rock, where some of the petroglyphs can be seen up close. There are several things seemingly illogical about this photo. Clearly, there are no petroglyphs immediately visible. In fact, I was turned the other way, into the desert, bathed in the mid-day sun. Further, despite the fact that the whole idea of the Valley of Fire is that it’s the bright red sandstone that gives the rocks their attractive color, I was shooting through a roll of Ilford FP4 Plus black and white film. But, I’m pleased with the way this turned out. The film’s sensitivity to red end of the light spectrum rendered the sand nearly white. 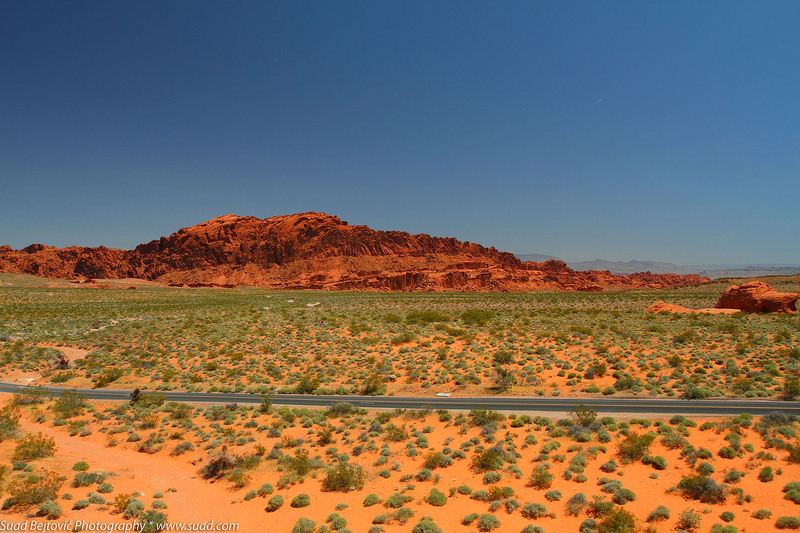 The desert, dotted with bushes and dissected by a straight road against the backdrop of rocky hills and distant mountains, gives off a quintessential American vibe; even more specifically, a Nevada vibe. So, it’s the wrong time of day to take a landscape photo, there is no clear subject, there is no color, and there are certainly no petroglyphs. And yet, at least for me, there is a story. For comparison, I included the digital color shot.